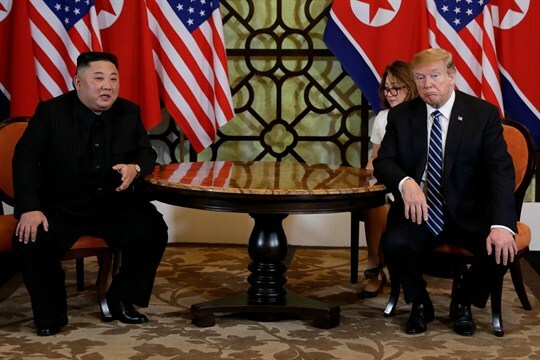 U.S. President Donald Trump and North Korean leader Kim Jong Un in Hanoi, Vietnam, Feb. 28, 2019 (AP photo by Evan Vucci). North Korea sanctions were back in the news last week. On Thursday, the United States Treasury Department announced economic penalties on two Chinese shipping companies for breaching United Nations sanctions on Pyongyang. That announcement was seemingly reversed Friday by President Donald Trump, who said on Twitter that he would be rescinding newly announced Treasury Department sanctions against North Korea. After some confusion, the White House explained that Trump was referring to as-yet unannounced U.S. unilateral sanctions, highlighting the administration’s lack of coordination on key messaging with regard to North Korea.